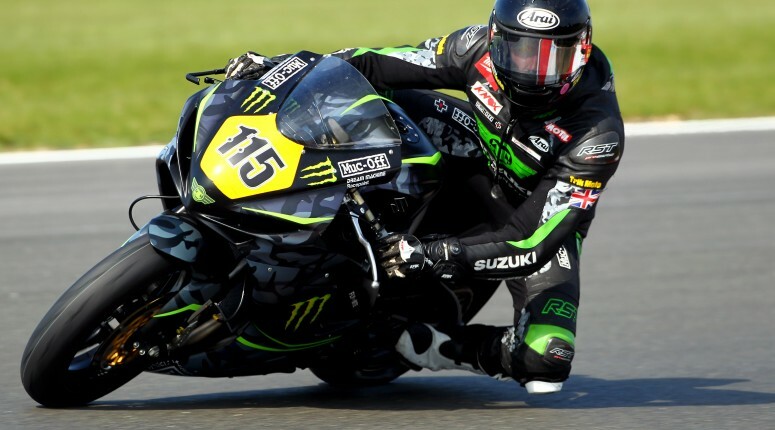 Keith Flint’s Team Traction Control fight hard at Round 3 of BSB, as the man himself is one of the VIPs at the MotoGP in Catalunya. James Rispoli got stuck right in during race one. He kept pace with the front runners and eventually finished in 8th, his highest placing so far. As the action started on the second day of racing at Snetterton, Team owner Keith Flint was being interviewed live on BT Sport’s coverage of the Catalunya MotoGP where he used the race as a stop over having played another sell out gig the night before in Poland. Unfortunately during race 2 at BSB is where it all came unravelled for Team Traction Control as James Rispoli suffered a huge crash whilst chasing the front runners. “When you are pushing over the limit all weekend something has to give. You can only save the front so many times before you can’t catch one,” he said. The crew showed no signs of defeat though – it’s very evident that the TTC guys have already got a trademark in determination. It was a fourth place finish for Steve Mercer in the Supersport EVO category, which was well earned especially considering the lack of straight line speed that the bike was pulling.